If you’re looking to explore “new” bicycling routes on Seattle’s Eastside this weekend, you can visit the two, long-awaited, completed sections of the Eastside Rail Corridor. Work crews are plowing ahead this fall to turn a 4.5-mile segment of the old BNSF railroad tracks between Renton and Bellevue into a bicycle-friendly trail by the first of the year. There are lots of way to celebrate New Year’s. If at all possible, I take a ride on my bicycle to welcome the new year. Earlier today, my new year’s ride down to Coulon Park in Renton happened to coincide with the annual Polar Bear Plunge at the park. 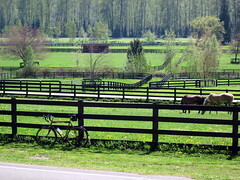 Today marked my best bike ride of the year as I headed out the 17-mile Cedar River Trail between Renton and Landsburg. Blue skies, almost no breeze, temperature in the 60s, blossoms on the trees and the river running cold and fast. Several bicycle and pedestrian projects can go ahead now that the Puget Sound Regional Council on Thursday selected the projects for federal funding. Some plumbing issues at the house sent me out on my bicycle to a hardware store in search of washers on Saturday. It was no longer a “plumbing emergency,” however, giving me a chance to explore a little bit on the way home. I started by heading east on Highway 900, part of the old Sunset Highway, between Renton and Issaquah. This is part of the first automobile highway over Snoqualmie Pass that was dedicated in 1915. 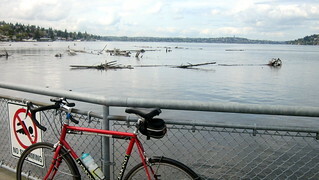 It ran through North Bend and Issaquah and around Lake Washington to Seattle. Today’s bike ride was to be an out-and-back errand to the video store to exchange movies. The continued summer-like weather — 70s and clear — distracted me to such an extent, however, that I took a wrong turn on the way home and ended up exploring down by the Cedar River. Boaters and rafters must consider these snags where the Cedar River flows into Lake Washington the same way that bicyclists view tacks or broken bottles in the road. Maybe worse. While a chard of glass can puncture a tire, a limb from one of these trees can poke a hole in a fiberglass boat or rubber raft and sink it. Although many novice bicyclists avoid hills on their bike routes, sooner or later they’ll decide to put those gears to work and challenge themselves on a steep climb. Suffering through the experience, many will go back to avoiding hills. But some who enjoy the suffering or the relief that comes when the ordeal is finally over, will be drawn to steep climbs.